Today’s Rehab At Home post is about “Auditory Memory“. Although, you may not have heard of this term before, it is important as it allows us to communicate with other people in everyday life. For children with hearing loss, the development of their auditory memory skills may have been disrupted if they had some time without access to sound. We’re going to look more at what auditory memory is, and explain some simple activities you can do at home to help your child with their auditory memory skills. We all use our auditory memory when communicating every day. Monitoring the auditory memory skills of children with hearing loss is particularly important for their speech and language development. Why Is “Auditory Memory” Important? Answer questions: Short term auditory memory is needed to listen to the question, process it, store the information and then formulate a response. Follow instructions: Short term auditory memory is needed to listen to the instruction, remember it and then act. Produce phrases and sentences: Auditory memory is needed in order to put words together to make phrases and sentences. For children, auditory memory is important for learning new words, concepts and sentence structures. A child needs to attend to, process, store and then recall those new words and concepts to use them later. How Can I Help Build My Child’s “Auditory Memory”? When giving your child directions at home think about how many critical elements are in your instructions. A critical element is the key word or key idea in the instruction—the part the child needs to understand to follow the instruction. If your child is able to follow instructions with one critical element for example, “Where’s the cat?”, try making your instructions more complex by giving your child instructions with two critical elements, for example “I need a spoon and a cup” or “Get the big book”. This will help to build their auditory memory skills. If your child can follow instructions with two critical elements, move up to three! As we want to build your child’s auditory memory skills, give the instructions through speaking only first. If your child is not able to follow the instruction, repeat it and give them a clue such as gesturing towards the object you are talking about. 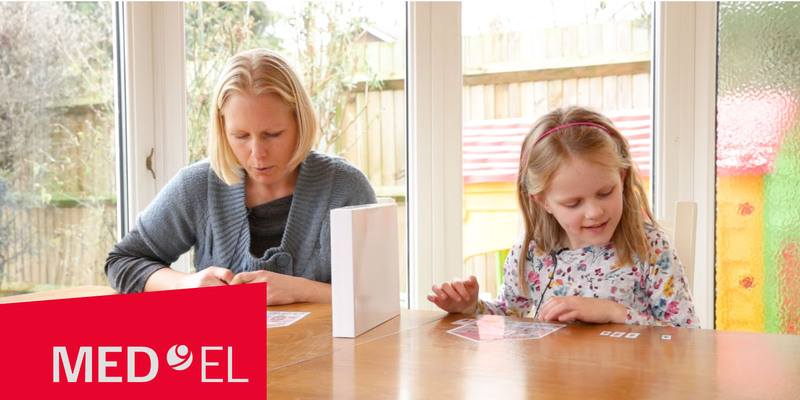 In this video, Jessica and her mum are playing a barrier game. Jessica’s mum gives instructions with two (“Put grandpa by the front door”, “put dad in the kitchen”) and three (“Put the little boy in the little bedroom by the desk”) critical elements for Jessica to follow. Next, Jessica can have a turn giving her mum the instructions. You can download the ‘My House’ board game here. Here are some other ideas for building your child’s “auditory memory” at home. At meal times, encourage your child to help you to prepare the things you need by giving them instructions such as “put the spoon on the table”, “wipe the table”, “I want the small piece of apple”. When getting ready for school, “we need to put your water bottle and your hat in your backpack”. Play games with figures or dolls such as going on a picnic or going shopping where you can take turns handing out items to different dolls, for example “The teddy is going to buy milk. Put the milk in the teddy’s basket” or “Give a piece of cake to the doll”. Play eye spy. This will encourage your child to listen to, process and recall a number of critical elements from your descriptions to be able to identify the object. For example “I spy something that you open outside, we use it when it’s raining to keep us dry, mine is red”. Play “Battle ships” or make your own barrier games such as drawing games. Like Jessica and her mum in the video, set up a barrier in between you and your child as you sit next to each other so you can’t peek. Give each other instructions about what to draw for example “draw a large purple circle”, “draw 2 small squares on either side of the circle”. Check your pictures match along the way. Help your child to retell a story or experience to others, recalling all of the details in sequence.